I wonder how many parts there will eventually be to this saga! Anyway, I've been laid up with that lovely winter vomitting bug for the last few days. In between calls on the great white ivory telephone I've made a little progress on the project over the last few days. 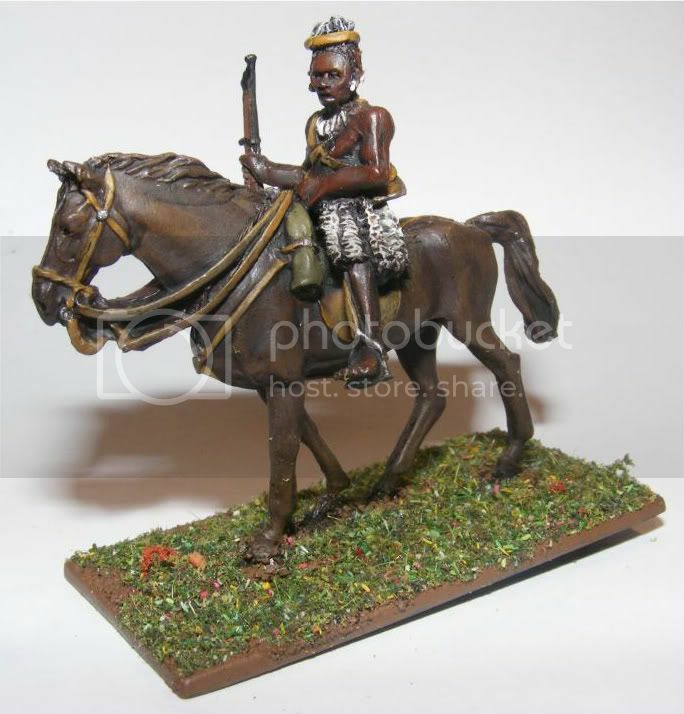 I've managed to paint another 16 unmarried Zulus and their InDuna. 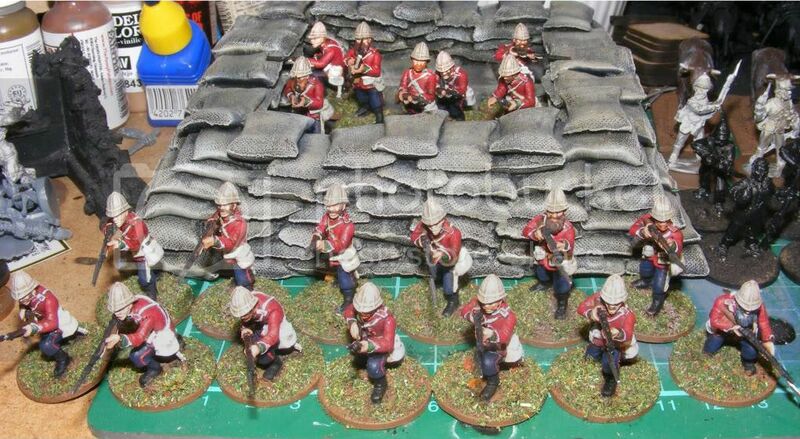 Just another 16 to go and that unit will be done giving me 3 completed units of Zulus (2 unmarried and 1 married) which leaves me with another 2 units of Married Zulus to build and paint and one more unit of Brits. On the subject of Brits, I finished the plastics from the original set as well. I then noticed that my "standard" basing mix was running rather low. I decided that I would make up a new mega batch of basing texture. The only problem is that try as I might, it doesn't match what I've been using so there will be a subtle difference next time I return to 1938 VBCW. Some of you might think that it is far too green for the terrain of Zulu land but actually the battle of Rorkes Drift took place during the wet season and so was far more green and lush than the films lead us to believe. This also has the added benefit that the scenery will be able to "double hat" for other periods such as 1938! I'm not entirely happy with the colour but it'll have to do now that it's started going onto the masses! I was also wondering what to do with all of those spare shields on the sprues. 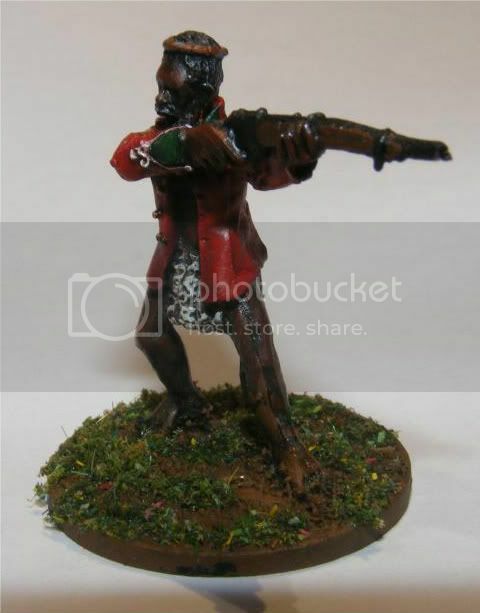 I contemplated attaching them to the back of the musket wielding chaps but when playing around this just looked plain wrong. After starting to work through the brilliant Black Powder rules I realised that I was going to need casualty markers and lots of them! I've got to work out what to use for the Brits now . . . . .
Other than that it's just been tidying up loose ends and finally moving some of this massive set through to the display cases as the vanishing cabinet was choc a bloc with stuff. I'm in the process of getting rid of the last bits of my fantasy collection on Ebay which has finally created a bit of space for this lot. Anyway, I'd better get back to basing while I'm on a roll. I really hate basing, I wish that I could do it as well as PanzerKaput does! 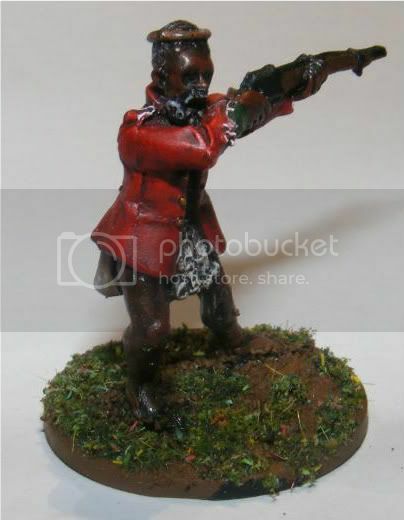 As a parting thought, is it any suprise that this chap is looking away from where his musket is pointing when the barrel is as wonky as this? Hopefully I'll be back in work tomorrow. The combination of the Falklands trip and 3 days sick means that my backlog of work is going to be horrific!